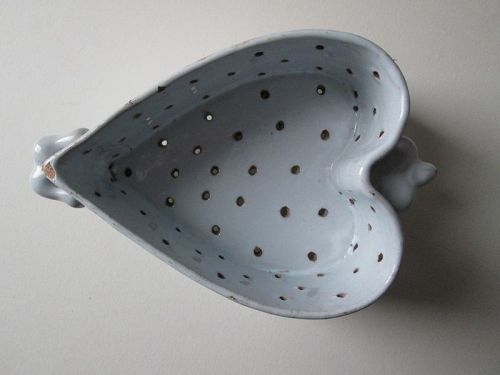 A Dutch delft heart shaped strainer on three short pointed feet and with attached handles at either end. 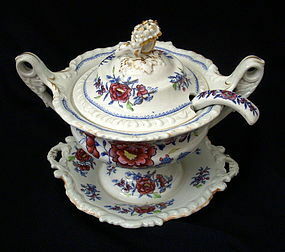 Old Pat Guthman Antiques label on the base with the price of $550. 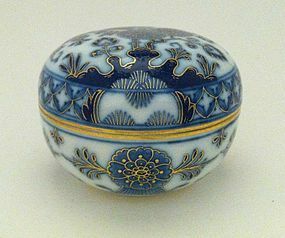 3inches (7.5 cm) tall, 5 inches (12.5 cm) wide and 7 ½ (19 cm)inches long. 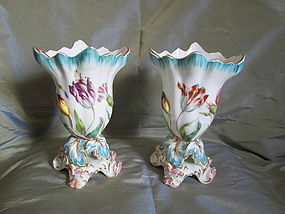 Condition: Minor glaze chips, a small chip to the body on the underside and part of one foot missing. 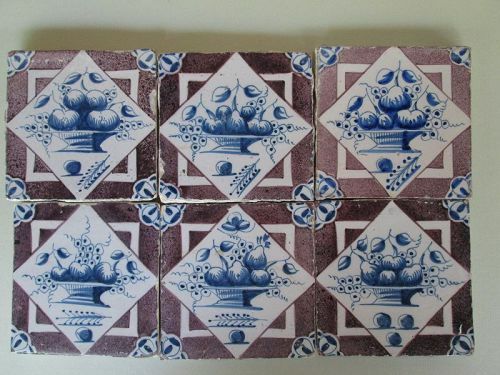 Good condition for the age and the softness of tin glazed earthenware. 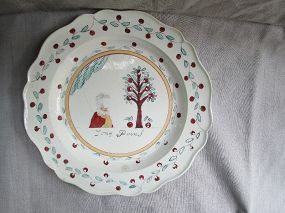 A well decorated, monogrammed and marked hard paste porcelain plate. 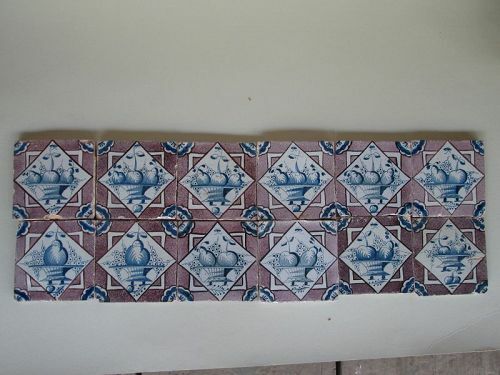 The outside border is decorated with a narrow peach ground and elaborate gilding with green dots and red lines. 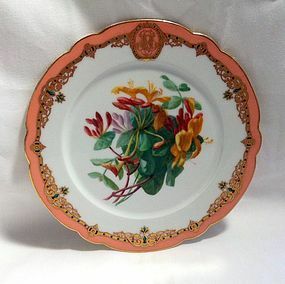 It includes a monogram dominated by the letter "R." The center of the plate is decorated with hand trumpet honeysuckle. 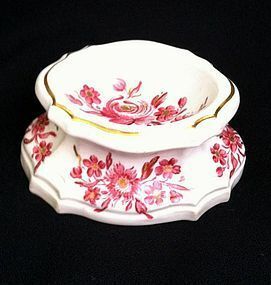 A well decorated, monogrammed and marked hard paste porcelain plate. 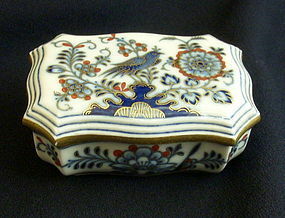 The outside border is decorated with a narrow peach ground and elaborate gilding with green dots and red lines. 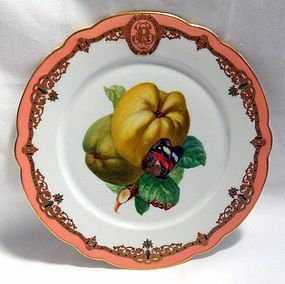 It includes a monogram dominated by the letter "R." The center of the plate is decorated with pears and a moth. 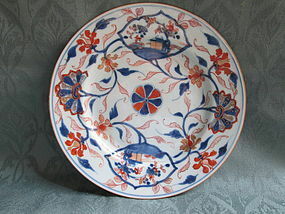 A well decorated Chinese Imari export plate with underglaze blue and overglaze red, orange and gold. The scene of flowering plants and a Chinese fence covers the face of the plate, from the rim on one side, across the center and onto the opposite rim. There is a single blue line at the outer border and a brown edge. 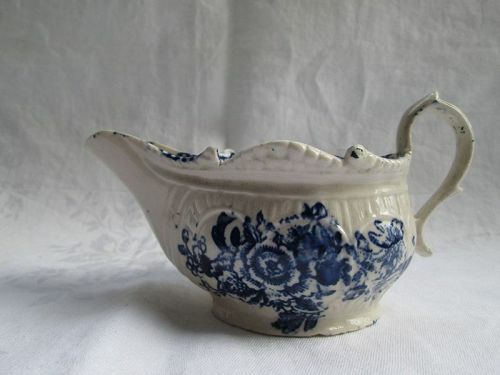 The back is decorated with blue and red trailing flowers and has an unglazed foot. 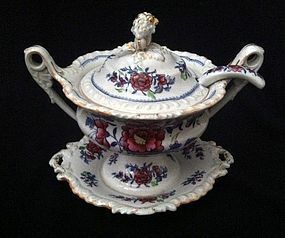 Probably the first quarter of the 18th century. 8 5/8 inch (22 cm) diameter. 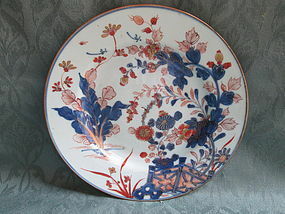 A complexly decorated Chinese export plate in underglaze blue with overglaze red, orange and gilding depicting scrolling plants, two panels with a house under a flowering tree and an octagonal symbol in the center. Brown painted rim. 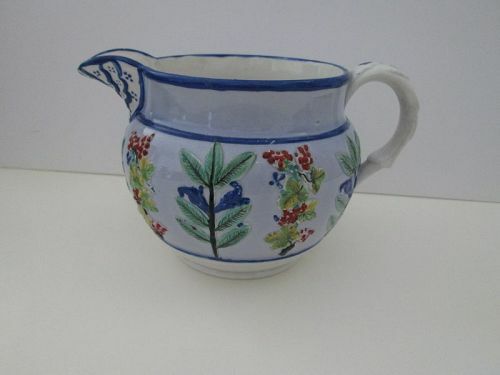 There are trailing blue and red plants on the back and the foot is unglazed. 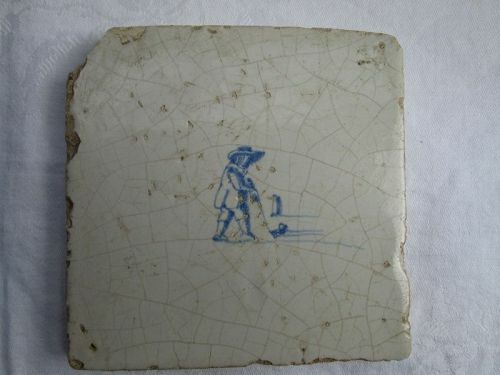 Probably more toward the first quarter of the 18th century than the second quarter. 8 5/8 inches (22 cm) diameter.